Kundalini energy in itself is a very powerful form of internal energy, situated at the base of the spine, it is described as a dormant sleeping potential force of our bodies. It is one of the components of an esoteric description of man's 'subtle body', which consists of nadis (energy channels), chakras (psychic centres), prana (subtle energy), and bindu (drops of essence). Through meditation, and various esoteric practices, such as Kundalini Yoga & Laya-Yoga, and kriya yoga, the kundalini is awakened, and can rise up through the central nadi (energy channels), called sushuma (communication channel to the brain), that rises up inside or alongside the spine. The progress of kundalini through the different chakras leads to different levels of awakening and mystical experience, until the kundalini finally reaches the top of the head, sahasrara chakra, producing an extremely profound mystical experience. 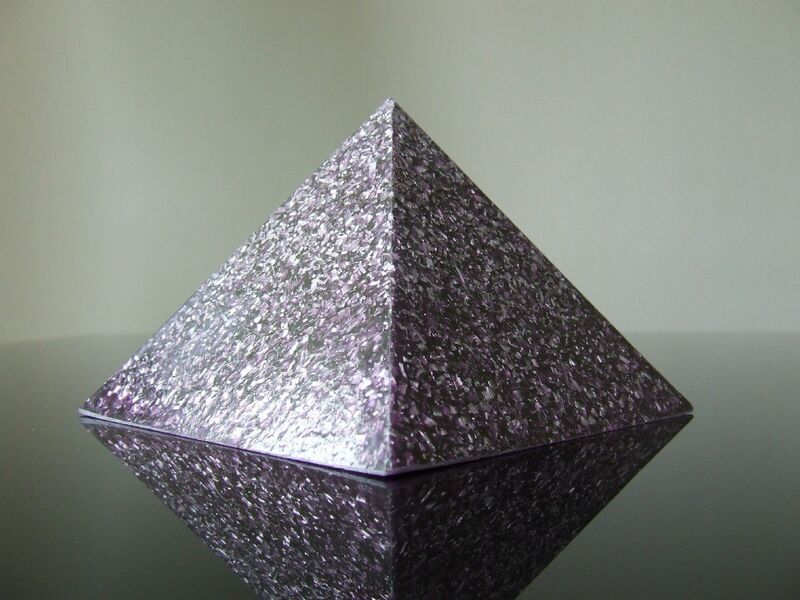 This energy balancing Orgone device will have your body and mind in tune with the Kundalini awakening. Meditating with this pyramid will speed up the process of awakening the dormant energy. Danburite acts as an amplifier to all the stones in the device. Herkimer, Smokey Quartz, Tourmaline, Obsidian, and Jet neutralize negative energies. Rose Quartz, Rhodocrosite, Rhodonite, Magnetite and Botswana Agate balance energy in the chakras. Hematite, Moonstone, Selenite, Apophylite, and Calcite give their extra energy connecting you to the universe and your psychic powers of the Kundalini. The Schumann Resonance Frequency of 13 Hz has been programmed into this pendant whilst curing, I play the Schumann Resonance Frequency on a continuous loop whilst the cure. The Schumann Resonance Frequency has been used for many years, it is even used in NASA space crafts to stabilise their Astronaut's health to protect them from high levels of radiation in space. The 13 Hz frequency is also the level that the Earth's Magnetosphere resonates at. Research has shown that our brains resonate at this 13 Hz frequency and it is essential for this to me maintained for optimal Physical and Psychological health.